The Jacobs University program offers students the opportunity to directly enroll at a prestigious international university in Northern Germany. With your new friends from Jacobs, you'll explore the charming small city of Bremen and its many restaurants, shops and parks. Participants in the program are fully integrated at Jacobs University—they live in residence halls on campus, take courses with Germans and other international students, and are able to take advantage of all the activities and services offered through the University. A semester at Jacobs is an excellent fit for students who are studying business, Global Health, the natural sciences, the social sciences and, of course, German language and German culture. Both semesters, there is a core course that includes activities and excursions in Germany and Europe at no additional cost--the fall semester core course is focused on European healthcare and welfare systems and the spring semester is focused on German politics and culture. The spring semester at Jacobs University is only open to students who do NOT meet the German language prerequisite for Junior Year in Munich (2 years of German language at the college-level). Students are responsible for booking their own flight. There is a small airport in Bremen which receives flights from many European hubs. Alternatively, students can fly to Frankfurt and take a train to Bremen. During the Orientation Week (O-Week), students will be introduced to the services available to them at Jacobs, explore the campus and the city of Bremen. In addition, students will receive important information about how to register for classes, apply for a residence permit, purchase health insurance (if required) and other university processes. The International Office provides student support throughout the semester, but students can also access regular student services on campus like the Counseling Center. Established in 2001, Jacobs University is Germany’s first private, international university. The academic programs emphasize a global and interdisciplinary approach. Just over 1,300 students attend Jacobs; approximately half are international students representing over 111 countries. Jacobs has partnerships with a number of US institutions, including Rice University and Carnegie Mellon University. Courses are available in a wide range of fields including the sciences, business, political science, psychology, global health, international relations, computer science, humanities, and mathematics. Nearly all courses are offered in English. All courses and semester language courses are taught in English. Students on this program will take a German language course, the Jacobs University core course (European Healthcare and Welfare Systems in the fall and German Politics and Culture in the spring) and two to four other courses of their choosing. The required German language course is worth 4 ECTS and the core course is worth 5 ECTS. Therefore most students will take two or three more courses worth 5 ECTS each. Each course worth 4 or 5 ECTS will translate as 3 credits each at Rollins. Rollins students will be studying alongside German and other international students. All courses are available to visiting students though prerequisites will apply and courses can be over-enrolled, in which case priority may be given to full-time students in the major. Visiting students have access to all the undergraduate courses including courses in sciences, math, computer science, business, social sciences and more. For a list of courses typically offered at Jacobs University, consult the course catalogue. If you need additional information for a course, please contact the International Office or contact the major department directly via email. Before arrival, please check to see if the courses you listed will indeed be offered. You will have an add/drop period at Jacobs to make changes to your course registration. There are multiple options to search for classes that best match your major. The simplest method is to select the correct term and then select one of the main tracks within the undergraduate curriculum: Health, Mobility, and Diversity. You can also select sub-fields within those main tracks to see more specific options. You should also be sure to search under the sub-fields within "Jacobs Track and Transdisciplinary Offerings" since many of the courses in this area are a good fit for a range of Rollins majors. This is also where the language courses are listed. Students participating on this program will need to seek the appropriate departmental approval for all major/minor requirements and approval for General Education Requirements through Student Records. All courses on this program appear on the Rollins transcript as transfer credits and the grades are factored into the Rollins GPA. Students who successfully complete the program through Rollins will receive an official transcript from Jacobs University. It can take up to 3 months to receive the official transcript. For the semester, students live in residence halls with German and other international students in one of the four undergraduate colleges: Alfred Krupp College, Mercator College, College 3, and College Nordmetall. Each college houses between 200 and 300 students and has a faculty member, who lives in the college with students with his/her spouse, serves as the college master. Each college forms a unique residential community within the larger university. Activities and events are sponsored by the colleges and help to develop the sense of community, while also providing international students with excellent opportunities to meet and mix with their fellow students. Rooms are singles with the bathroom usually being shared by two students. Students are strongly encouraged to not bring bedding with them, rather purchase a new bed-set on arrival, as bed sizes differ country to country. For more information about the housing, peruse the Jacobs University accommodation website. Each college has a student lounge, game and TV rooms, pool tables, quiet study area and a meeting room. In addition, a laundry room with washers and dryers, a bike storage unit and a party zone are found in each college. Each College serves three meals per day in their dining hall. Also, there are kitchens in each corridor if you wish to purchase groceries and prepare food outside the dining hall. You don’t have to eat just in your college; you can eat at any of the four colleges on campus. Students use their personal Jacobs University Campus Card to purchase meals on campus. During the fall semester, students will enroll in "European Healthcare and Welfare Systems" and will engage in a series of included activities and excursions including opportunities to connect with healthcare professionals in Bremen and visit Brussels, the seat of the European Union. During the spring semester, students will enroll in "German Politics and Culture" and will engage in a series of activities and excursions including visiting Berlin and St. Petersburg. Jacobs offers students a variety of means to become involved on campus. The Campus Activities & Intercultural Affairs (CAIA) department coordinates activities on campus to bring students together. Activities include sports, arts, student government and a wide variety of clubs. You can find out more about what specific activities and events are offered by visiting the Campus Activities Portal. 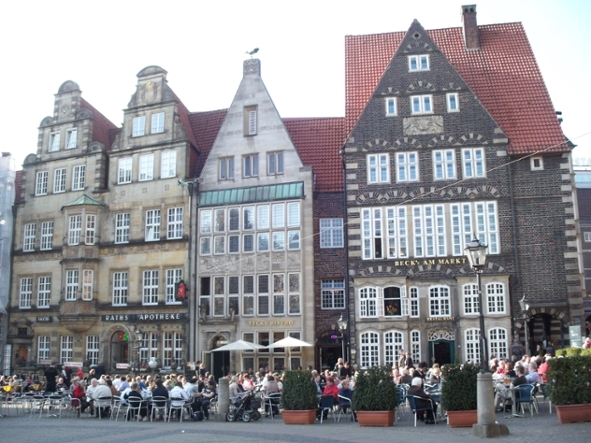 Students at Jacobs can also take advantage of the activities and events in the city of Bremen. Students have the opportunity to participate in Jacob University’s Host Family Program which pairs students with local Germany families. Host families might invite you to their home for dinner, include you in a family outing, or just join you for an afternoon coffee. This program is a fabulous way to get a taste of day-to-day German life and meet locals who can introduce you to Bremen and the surrounding areas. Past students have had incredibly positive experiences with their host families and have found this aspect of the program to be a real highlight.